Well, I have been trying to talk myself out of starting a (really) small post-apocalyptic-ish neighborhood to get back into the mood to actually play the game, but have pretty much failed at doing that. So, it is now time to make a bunch of things for said neighborhood. Thought I would share some things here and there in case others have some use for them...even in their normal games. 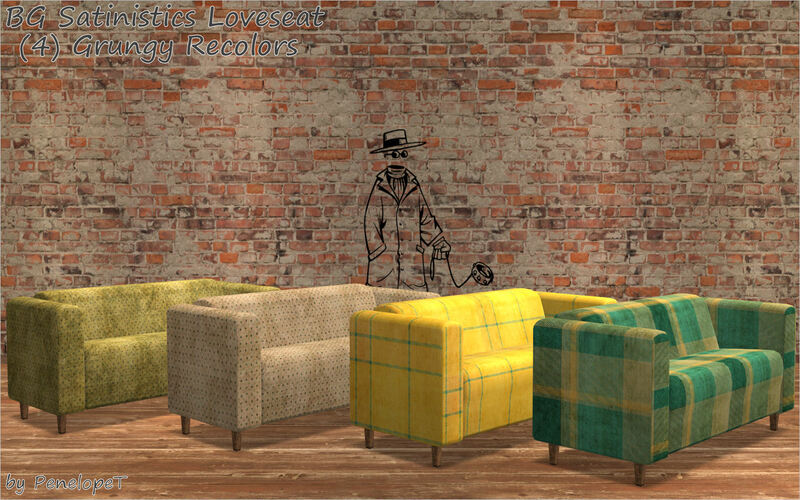 The download includes (4) grungy recolors of the BG Satinistics loveseat. The recolors will show up on any Satinistics add-ons you have. Everything is clearly labeled and the swatch above is also included in the download for convenience. 64 people have said thanks to PenelopeT for this download.